Last week, I’ve been seeing the TempuRamen on my newsfeed so I immediately check if there is a branch near us. Fortunately, there is branch at Festival Mall so I told my husband that I want to try this restaurant and he agreed. 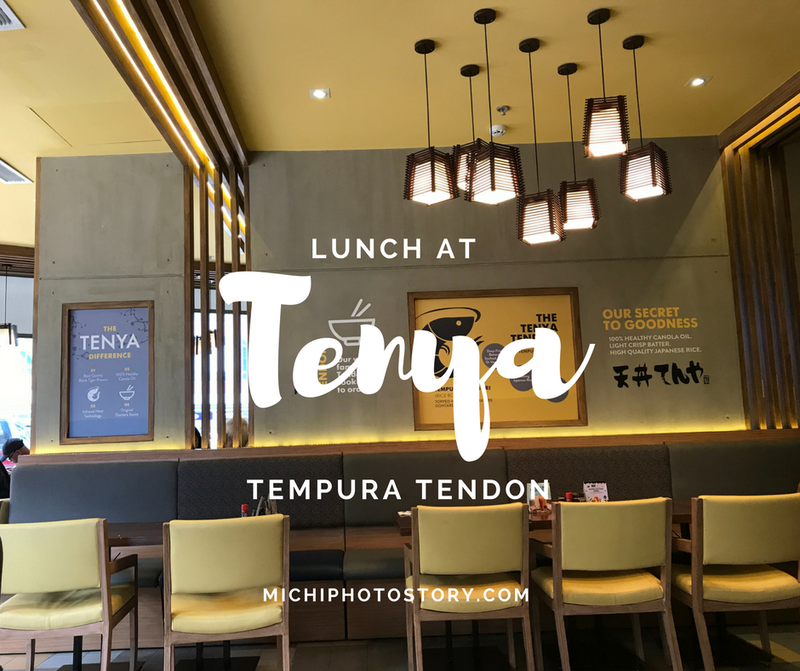 Tenya Tempura Tendon started in 1989 at Tokyo Japan and it is the most successful tendon restaurant chain in Japan. Tendon is short for Tempura Donburi (rice) bowl. 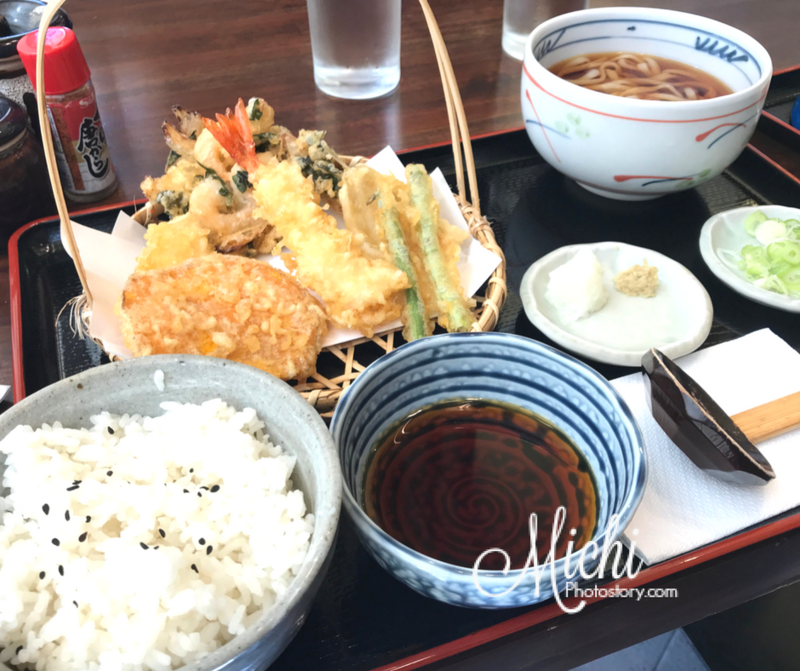 They aimed to serve high-quality tendon and tempura at an affordable price. Aside from Japan, Tenya operates in Indonesia, Thailand and of course Philippines. We’ve been to Tokyo, Japan but I cannot recall if I’ve seen Tenya restaurant there. Anyway, last Saturday, after my Psorclub meeting at Asian, we had early lunch at Tenya Tempura Tendon, it is located in the Water Garden of Festival Mall. The restaurant is not that big, good thing we had early lunch so it is not yet crowded. Upon arrival, the staff immediately ushered us to our table and gave us the menu. We took our time browsing the menu and we could not find the TempuRamen so we asked the staff and she gave us a flyer. My husband loves Japanese foods while my son and I only eat some of the Japanese foods, so we like katsu and tempura, basta cooked meals. I tried eating ramen before but it is not really my favorite kasi feel ko lang siya kainin if the weather is cold or if I’m not feeling well. My husband ordered TempuRamen for P295, It is a combination of tempura and ramen. 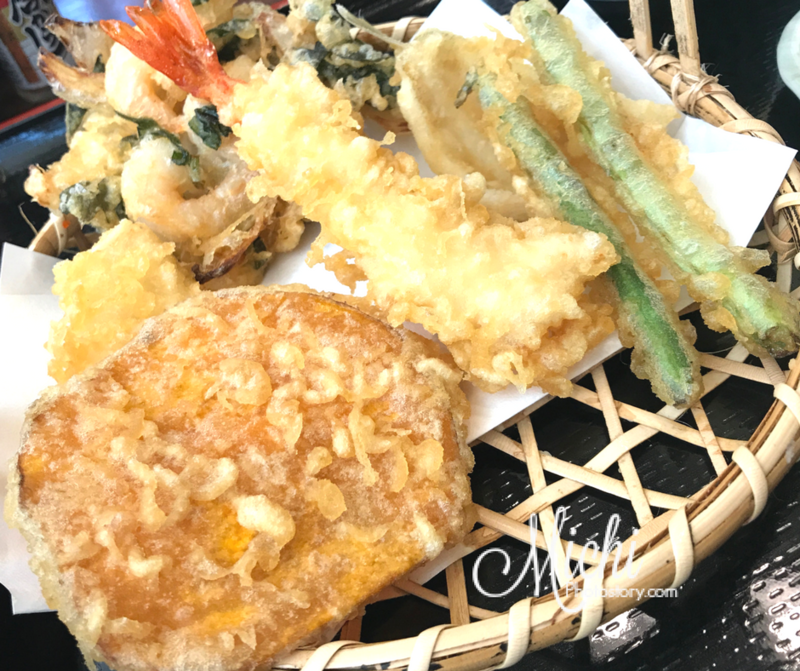 It served mixed tempura, you can taste black tiger prawn, eggplant, and green beans. For ramen, you can have wheat flour noodles in tonkotsu broth with corn, ground pork and soft boiled egg. At first, I ordered Classic Tendon for P225, it has black tiger prawn, squid, kisu, green beans and sweet potato. 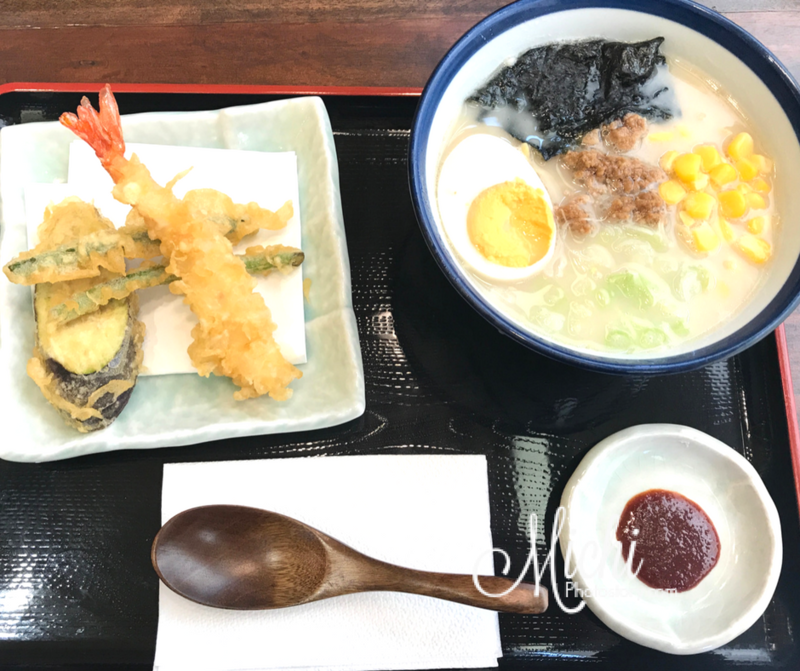 But the staff suggested the Classic Tempura Soba/Udon Teishoku for P315. Nasalestalk naman ako, Lol! This meal has high-quality soba and udon imported from Japan. It comes with Japanese rice, mixed tempura, tempura sauce, radish, leeks, and ginger. You can choose either hot or cold soup, of course, I chose hot. When they served the meal, I was #shookt because the serving is too big for me. I tried my noodle soup and I did not enjoy it because ang hirap lunukin ng soba/udon noodles. Hehehe! Mas type ko yung ramen ni hubby. So if ever I’ll go back, I will stick to Tendon Sets, mas mura pa. If you have kids, don’t worry they offer Kid’s meal too, you have two option and my son chose the Kids Meal 1 for P245. The only difference between two meals is the tiger prawn, Kids Meal 1 has one prawn and Kids meal 2 has two pieces of prawn for additional of P20. 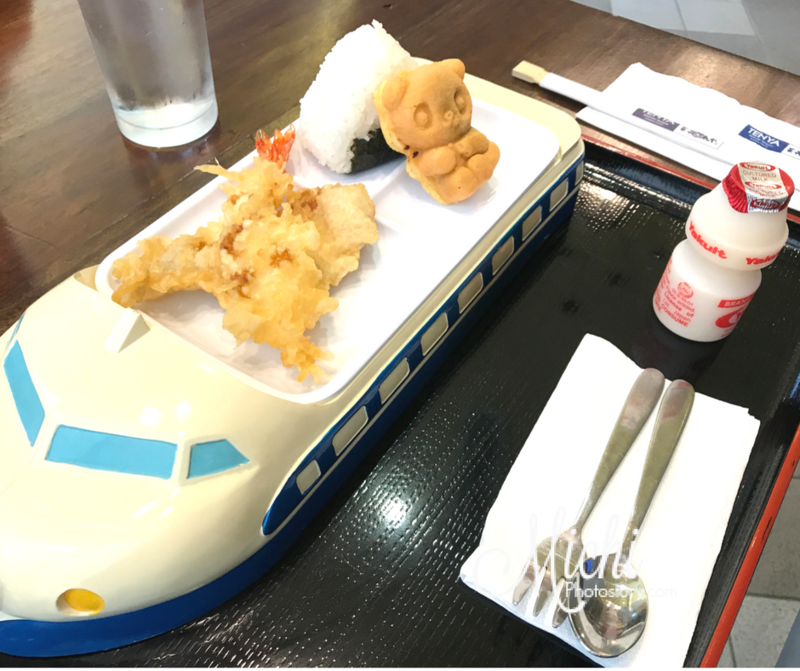 You can also choose the serving plate, for boys you can choose train, boat, and car. The meal includes 1 black tiger prawn, chicken fillet, onigiri, ningyo-yaki and yakult. The kid’s meal is already a complete meal, you have the main course, drinks and dessert. My son enjoyed and finished his meal, he just removed the nori because he doesn’t like that. The price is not affordable but overall we liked it. The food is good, I enjoyed the light and crisp battered mixed of seafood and vegetables. My son likes the ningyo-yaki, it’s the baked Japanese cake with nutella. Service is good too. I wasn't that much a ramen lover before I met my hubby. He loves ramen and I eventually got hooked on it too. Haha! That's also why we are always looking for ramen places to try. Will definitely try Tenya soon. Would love to try Tenya as well, everything looks delectable and mouthwatering. The kiddie meal is big plus if you are looking for a place to dine with children. Nakaka #shookt nga nyahaha! I'm not a fan of soba noodles too, I prefer ramen. I love the kiddie meal, so cute! Pang-bento lover! Not a ramen lover before until my best friend brought me to some of the best ramen places. Got to appreciate the taste of ramen. Learned from those visits too that japanese food houses do not serve tempura, sushi and the like because these are all fusion na. I've only fallen in love with Japanese cuisine recently. I used to avoid it. As they say, the ignorant speak of what they do not know. Anyway, I'm still not much in to ramen but my husband is crazy about it. It's the sushi I love. But I've always liked Tempura. We may try this once we visit Festival mall again one of these days.